Our first visit was to the Rebuild by Design Offices where Lynn Englum told us about the regional design competition, Rebuild by Design, which was set up in response to the effects of Hurricane Sandy. It asked multidisciplinary teams to design solutions that addressed resilience and its multiple dimensions of critical infrastructure, community, environment and economy. 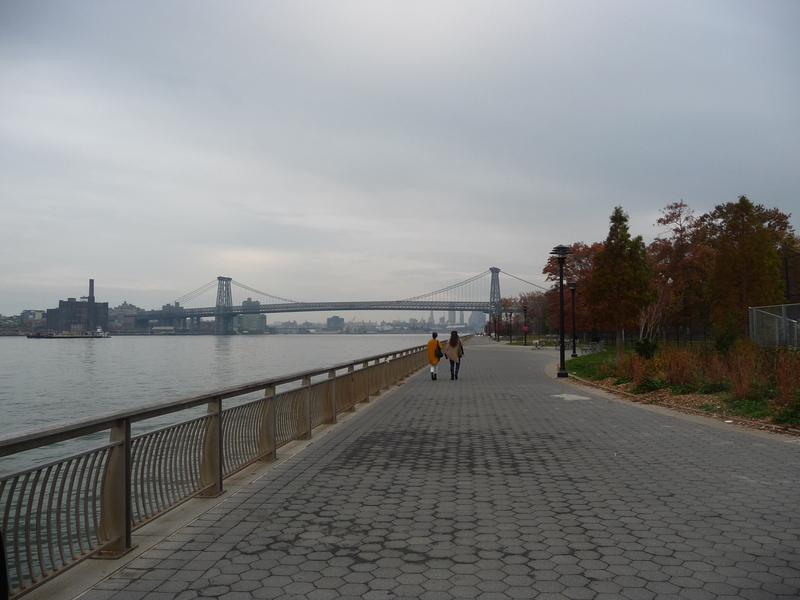 The competition resulted in a shortlist of 10 projects located in the region affected by Sandy. One of these projects, called the BIG U, proposed coastal flood protection for lower Manhattan through an engineered solution that provides dual purpose infrastructure – one that protects against rising water and also provides liveable public spaces. The project design was made up of a number of discrete yet coordinated zones, one of which focused on an area in the Lower East Side. Above: The East River. Photograph taken by the author. To help engage community members, the team worked with LES Ready!, a coalition of community based organisations committed to disaster response and preparedness. Our second visit was to the Good Old Lower East Side (GOLES) offices to meet Lilah Mejia. 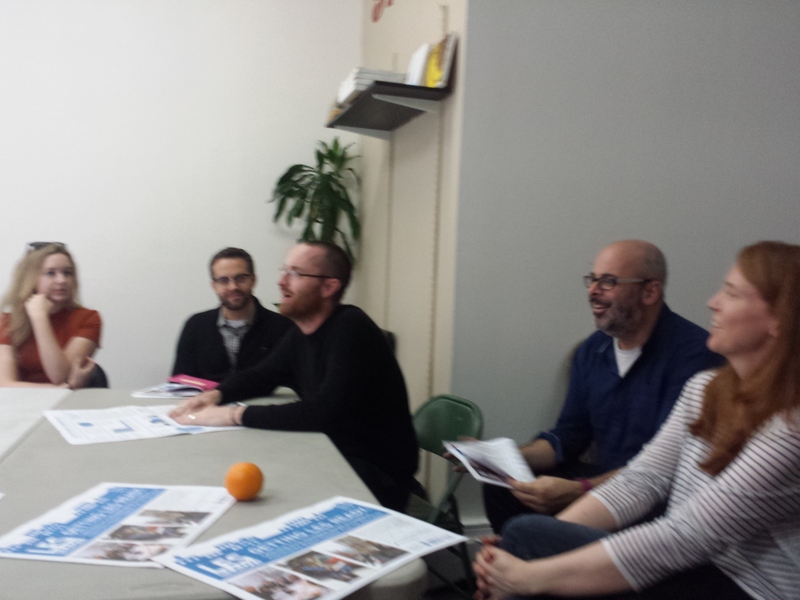 GOLES was involved in the community response to Sandy and as a member of LES Ready! was part of the community consultation and research process for the Rebuild by Design competition. 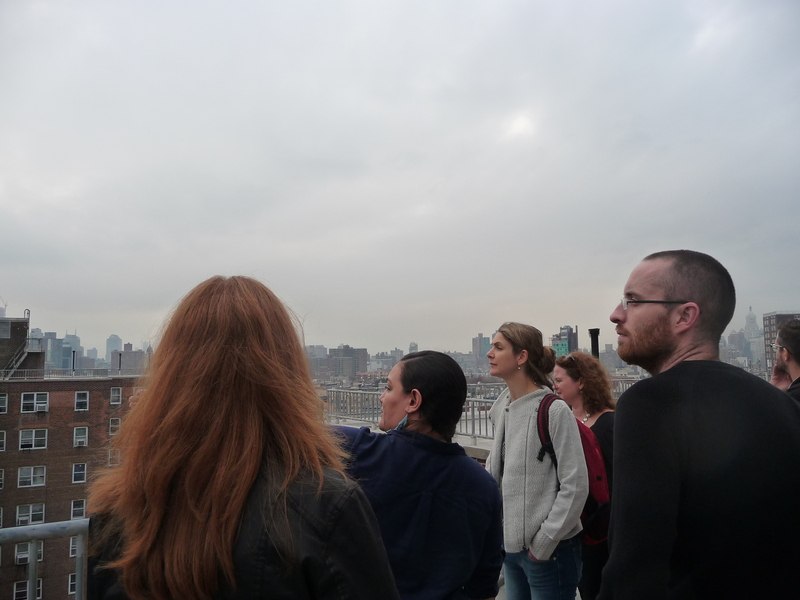 Our visit to GOLES incorporated a walking tour, led by Lilah and her colleague James. We walked through parts of the Lower East Side where people’s lives were affected by flooding and power cuts during Sandy. The discussion that followed explored the immediate community response to Sandy, including the coordination of emergency welfare through GOLES. The event was also consequential to how long-term priorities of GOLES have been communicated and campaigned. 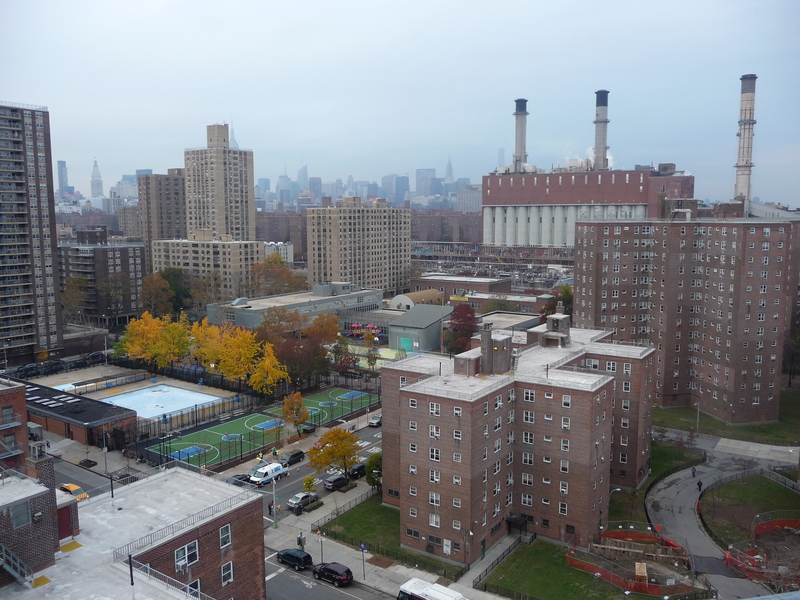 In a post-Sandy context, concerns about gentrification, maintenance and repair of social housing stock and improved access to clean and safe public spaces have taken on a new significance, used to generate a claim for community resilience in everyday life, oriented towards a possible future emergency. Above: At the offices of GOLES. Photograph taken by the author. Above: Lower East Side. Photograph taken by the author. 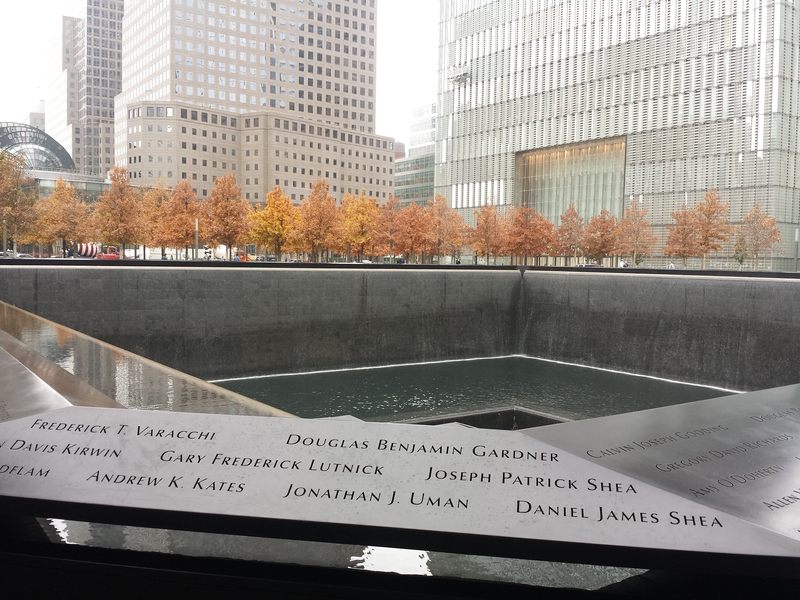 On the second day, we spent the morning at the World Trade Center site. We first visited the 9/11 memorial and museum. The museum takes up a large underground area, beneath the original sites of the twin towers, which is somewhat unfamiliar and disorienting. It recounts the events of that day in exhaustive detail, reminiscent of the inquiry style of reporting, which, in the dizzying underground setting of the museum is also emotionally exhausting. Above: The North Pool. Photograph taken by the author. 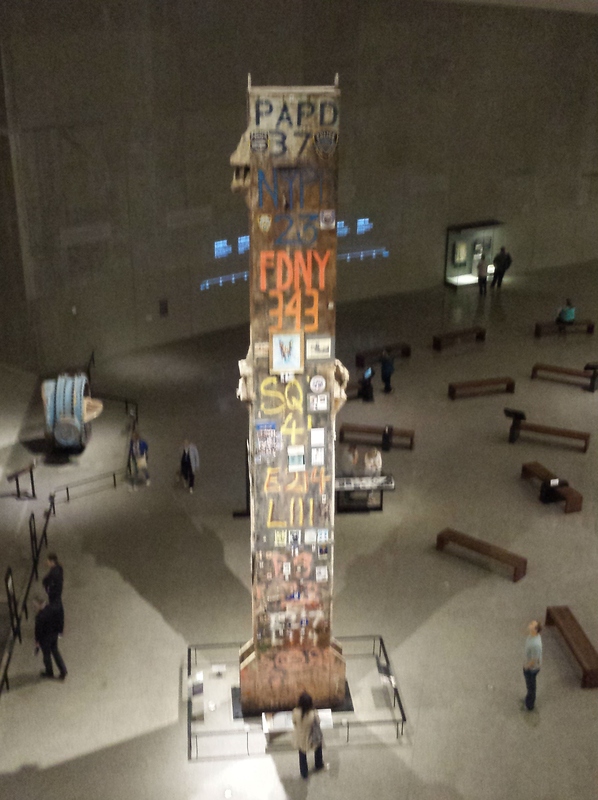 Above: The Last Column at the 9/11 Museum. Photograph taken by the author. After our self-led tour of the museum, we met Todd Fine, a historian from the Washington Street Historical Society. He discussed the controversies around memorialising 9/11, including the funding of the 9/11 complex, the design of the memorial and algorithmic placing of victim names and the museum’s presentation of infrastructural artefacts. After spending time at the North and South Pools, we walked around the surrounding area. We were introduced to what is left of the area known as ‘Little Syria’ in Manhattan’s Lower West Side, where Todd emphasised other claims to loss in the area by remembering the conflict between preserving/remembering immigrant communities who settled there and the growth of more recent capitalist developments. 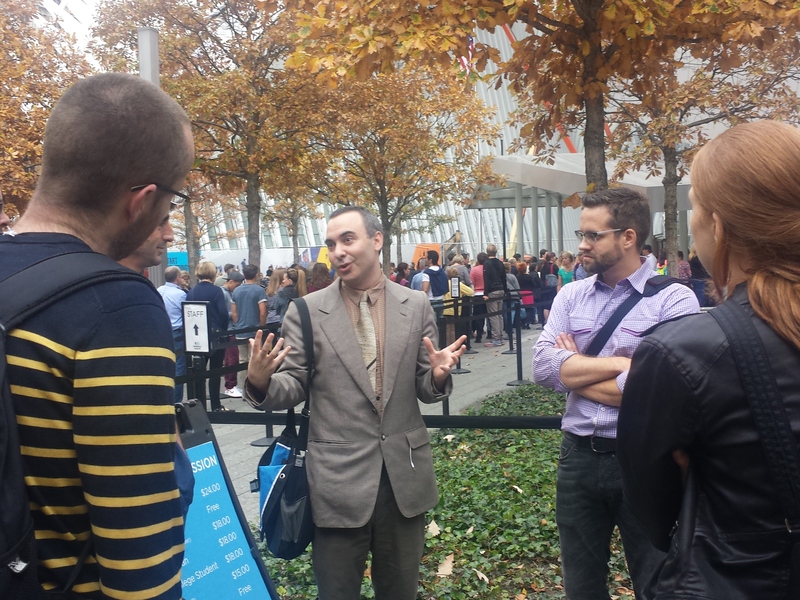 Above: Todd Fine outside the 9/11 museum. Photograph by the author. 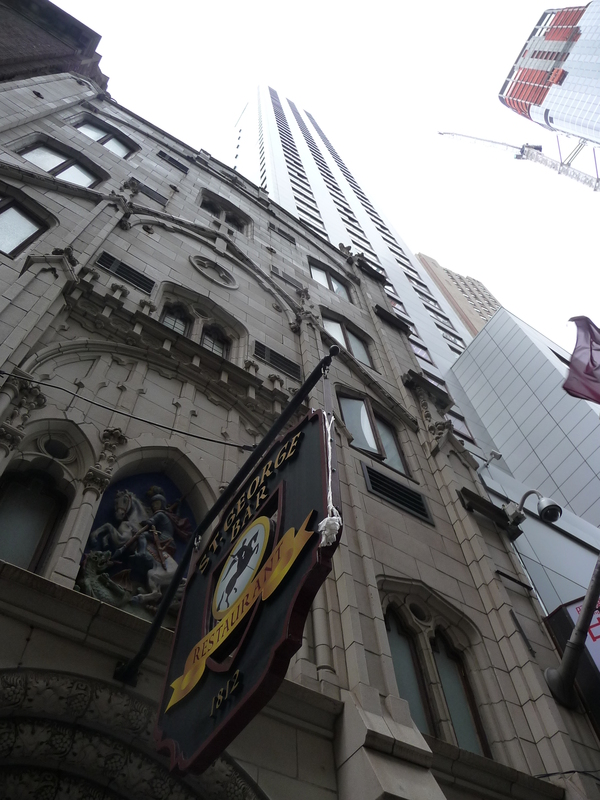 Above: The former St. George’s Syrian Catholic Church on Washington Street, with the Holiday Inn Manhattan Financial District towering above it. Photograph taken by the author. 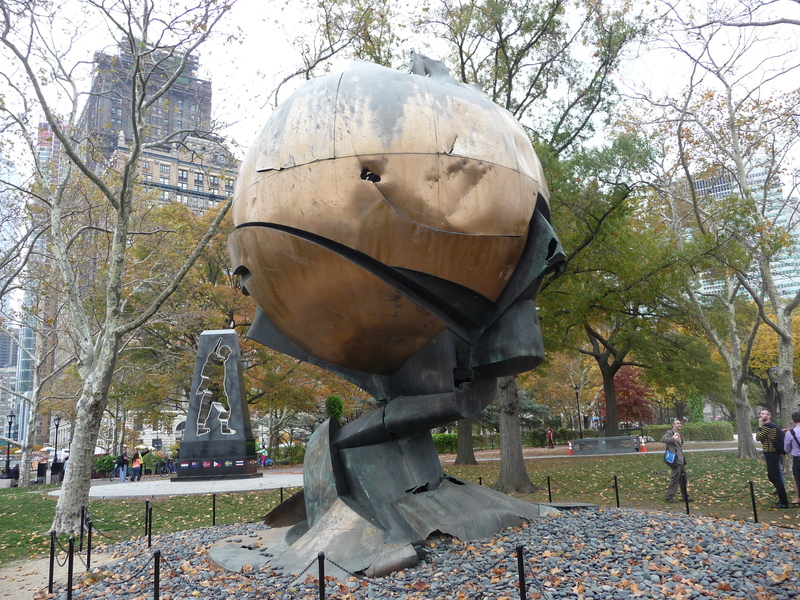 Above: The Sphere, which was originally located in the World Trade Center plaza, now resides in Battery Park, New York City, bearing the scars of 9/11. Another way of remembering? The series of Governing Emergencies workshops are coming to a close, with discussions currently ongoing for at least one more meeting to consolidate learning and continue debates around the key themes shared by members: emergency, crisis, resilience. If you would like to engage with the network, please do get in touch. This entry was posted in Emergency and crisis and disaster and... and tagged emergency response, Governing Emergencies workshop, memorialisation by rjgordon2014. Bookmark the permalink.